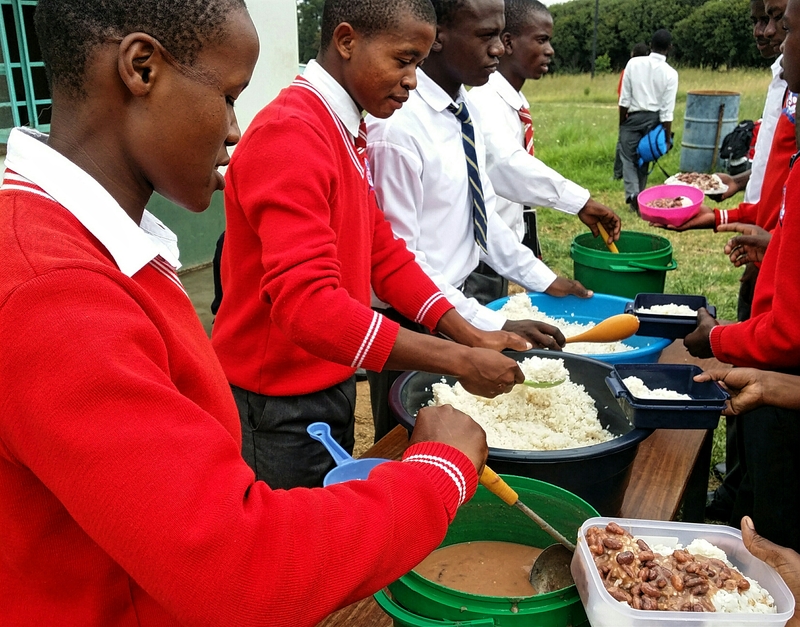 The schools in Swaziland serve lunch every school day. The daily menu is minimally varied. Some days, the students are treated to soupy beans with rice. On other days, the afternoon delight is non-soupy beans with rice. School lunch costs are included in the annual school fees assessed to secondary school students. All primary school students and some secondary school students are fully funded by government. At lunch time, students line up outside of the kitchen with her/his dish and eating utensil. Four or five older students are responsible for serving their classmates. They set up a table with at least two basins filled with rice and at least two basins or buckets filled with beans. After being served, students sit around the school grounds while enjoying lunch. Students can supplement their lunch with snacks from the bomake market.